What is diabetes, and how does it work? I'm sure many of you know what diabetes is, but do you really know how it works in your body, and why some of the things you do every day are difficult for people like me with diabetes? I think there's a large misconception of what really happens with diabetes and how those of us who are diabetic cope with everyday issues. First off, there are two categories of diabetes. The first category of diabetes is insulin-dependent diabetes. Insulin-dependent diabetes is commonly referred to as "Type 1 Diabetes" or Diabetes Mellitus. You will typically see type 1 diabetics with syringes or insulin pens injecting themselves before meals, or with insulin pumps (that are typically about the size of a pager) messing with buttons trying to inject the missing insulin into their bodies. The other category of diabetes is insulin-resistant diabetes. Insulin-resistant diabetes is commonly referred to as "Type 2 Diabetes" and is typically seen in individuals who are older or overweight. While there are two categories of diabetes, there is a general rule of thumb that no one falls into a single category completely. Many insulin-dependent diabetics also have some insulin resistance, and many insulin resistant diabetic end up becoming insulin-dependent as they age. Some more information about the mechanisms of diabetes and the role that insulin plays in your body can be seen in the video below. This video is a great generalization of how your body deals with food and how diabetes can block it. How does diabetes affect my daily life? For most of you who are non-diabetic, you eat food, your body notices an elevated level of glucose in your blood stream and your body (pancreas) will produce the hormone insulin and that insulin will help transfer the glucose from your blood stream to your cells for energy. As you can imagine, there is a very, very fine balance of how this entire system of your body works, and it works in a way that is quite complex to overcome and replicate. What most diabetic patients are trying to do, is replicate this process. This process, that is still a very person-specific process and has many things that we're not really able to test regularly or use to our advantage. This process that has been through many forms of evolution and has had a significant advancement in the last century of knowing how we can attempt to mimic this reaction. This is what I try to do on a daily, hourly, minute-by-minute basis and tend to struggle with most of the time. Our bodies are VERY complex, and that's putting it nicely. Our bodies hold a lot of secrets that researchers are still trying to discover. I find myself impressed with myself when I have a day where my sugars were held at good levels throughout the day, even with eating meals, but it takes a lot of preparation. When I'm getting ready to eat, I've found that giving myself insulin about 10-20 minutes prior to eating is helpful in keeping my sugars in a good range for a longer period of time. Now, if you're not absolutely amazed by this, I'm not sure what to tell you, I'm in the process of replicating a part of the body that performs complex balances with hormones and has 'sensors' in the body to better judge the needs of your body based on sporadic events of eating food, and drinking beverages with glucose in them. If you're not aware, just about everything has glucose in it, which makes anything you ingest affect your blood glucose. The amount of granularity that I have to keep this in check is very limited, I get to see a one-time snapshot of what my body currently has with respect to the amount of glucose in the blood (in milligrams of glucose per deciliter of whole volume blood). A 'normal' range of glucose for a non-diabetic would be between 70 and 90 mg/dL fasting, but sub-100 mg/dL is common for all non-diabetics. Seeing numbers above 100 is where the cause for concern comes in as being considered pre-diabetic or diabetic. The insulin that your body naturally gives you (if you are not (pre-)diabetic) would limit your highest blood glucose to around 150 right after meal consumption, but would quickly drop you back down to a normal level. Throughout the day, your body is also constantly giving you insulin to counteract metabolism, this is known as basal insulin for diabetics and can be delivered either through a single injection of a long-acting insulin or through a continuous injection of a short-acting insulin by means of an insulin pump. When it comes to correcting for a high blood sugar (anything above 100 mg/dL) a correction bolus is given, this is always with a short-acting insulin. For those people on a pump, this is just another increase in the rate of insulin release by the pump, but for non-pump-users this is usually a second injection either by syringe or insulin pen. If you are not diabetic, imagine having to poke yourself every time you wanted to have food, or drink with sugars (carbohydrates) of any sort. So, why do I go through all of this, why explain what's going on in my daily life to the "internet" and who really cares? Well, I believe you care, you, the reader who have made it all the way down to this part of my blog post. You have read all of the information and are waiting for a conclusion to the 'story'. Here's your conclusion, oh dear reader. When things go well, it feels like I've cured myself of this horrible disease, because I feel like I can counteract the issues that I deal with on a daily basis. Yesterday was one of those days. 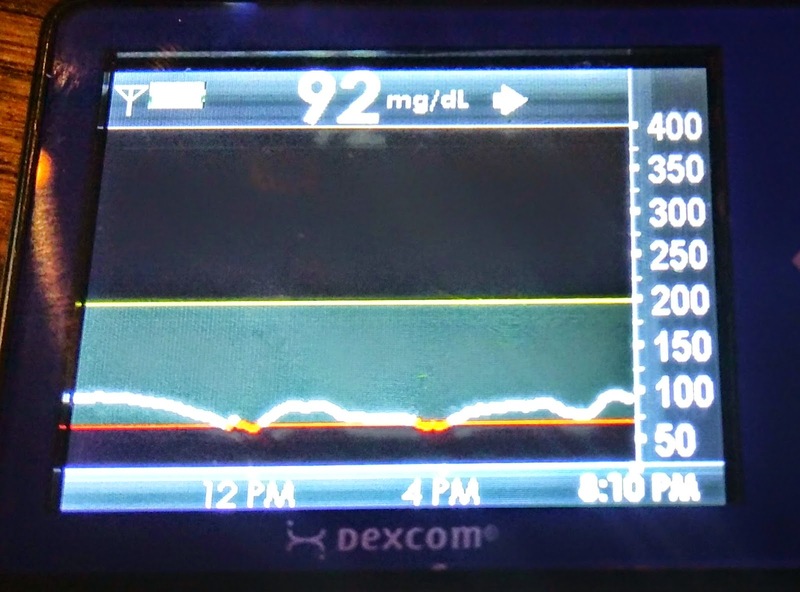 I made a post on my Google+ page with an image of my continuous glucose monitor showing a line where the dots all fell below a glucose level of 115 mg/dL (shown to the right as well). For you non-diabetics, that's 'normal' for me, that's absolutely amazing and something I wish I could do continually without as much effort as it takes. Days like yesterday remind me of how healthy I could be and how much better I can do, but it takes a lot of effort and energy to do so. After a 14 hour day of having those good sugars, you deal with the lows because it's more likely to hit the lows, but you also deal with the highs because you want to prevent them from lasting as long as they do. It's stressful, and it's exhausting, but the reward is most certainly worth the effort that's put in in the long run. Complications are dramatically reduced, you end up just feeling healthier as a whole, It's not easy, but it's VERY rewarding, and I just thought I'd post my exuberance about the whole situation.